Longtime Sisters resident John Rahm has developed what many who have used it call "the best product of its kind." Called the SweatHawg, it's a hyper-absorbent, hyper-wicking headwear piece that solves the problem of sweat in the eyes; the burning, blurred vision and smeared glasses. An avid cyclist, for years Rahm had suffered with the sweat issue. "I rode with sweat dripping in my glasses for many years and tried every product that promised to help before the light bulb went off one day, and I sewed up the first simple SweatHawg," said Rahm. "It's not like any other product out there. It's a marriage of hyper-absorbent felt with hyper-wicking and drying fabric. It's so simple! For those of us who sweat a lot, the SweatHawg not only keeps the sweat out of your eyes, the wicking fabric moves it from your forehead where it evaporates and aids in cooling." Originally made solely as a helmet liner for cyclists, Rahm thought the product could benefit others as well. "We're redefining our company," said Rahm. "We're now called SweatHawg Headwear. We're moving from a cycling helmet liner to a multi-faceted headwear company dealing with excess sweat. Along with our original helmet liner, we're now making several other applications. 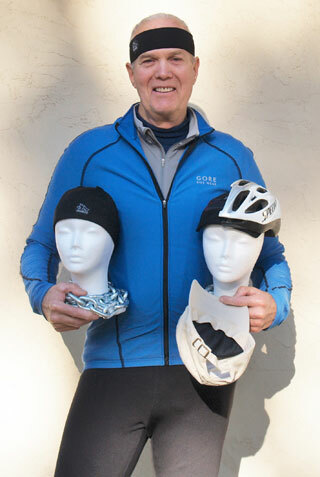 We have two versions of the helmet liner, a headband, a skull cap (beanie) for cyclists, cross-country skiers, etc., a cap/hat insert, for baseball caps, etc. and one for a construction hard hat. We're in the process of developing a runner's hat, a traditional cycling cap, and a helmet liner with a bill." The Rahm family moved to Sisters in 1995, having become enthralled while visiting a few years earlier. They have operated AmeriSpec Home Inspection Service since their arrival. John served on the Sisters City Council from 2001-2004, and then the Sisters Planning Commission from 2004-2007. John also served as chair of Sisters Trails Alliance for four years. He was instrumental in the development of the Peterson Ridge Trail, and was recognized by the Chamber of Commerce as Volunteer of the Year in 2010 following completion of that project. It is in that spirit of community that Rahm decided to share his invention. "The first event where we offered them to the public was the 2012 Pole Pedal Paddle," he said, "and in the last year-and-a-half we have sold over 2,000 at events and through our website all over the world and on every continent but Antarctica." Rahm hopes to continue to grow the company. "We want to have a product for anybody doing anything where sweat is an issue," he said. SweatHawgs are made right here in Oregon at a sewing facility in Stayton, and another larger facility is available in Salem as needed. The Rahms intend to keep their products "Made in the USA." SweatHawg helmet liners can be found in local bike shops, and all SweatHawg products along with photos and more information are at www.SweatHawg.com.